I was happy to follow my Ulysses Reading Course by serving as the Consulting Curator for an exhibition at the Rosenbach Museum and Library in the summer of 2013. "Thy Father's Spirit: Paternity in and of Ulysses" took advantage of the coincidence of Bloomsday and Father's Day to flesh out Stephen Dedalus's playful proposition that paternity is a legal fiction. The exhibition gathered objects testifying to the novel's difficult birth, from manuscript passages dictated by Joyce when his sight prevented him from writing, to later proofs in which Joyce continued to augment his book (much to the consternation of the printers). Other objects included a collaboration between Joyce and his daughter Lucia, whose illuminated opening initial is featured in Storiella as She is Syung (1937), as well as copies of Haveth Childers Everywhere (1931) exploring the psyche of the father figure in Finnegans Wake (1939). 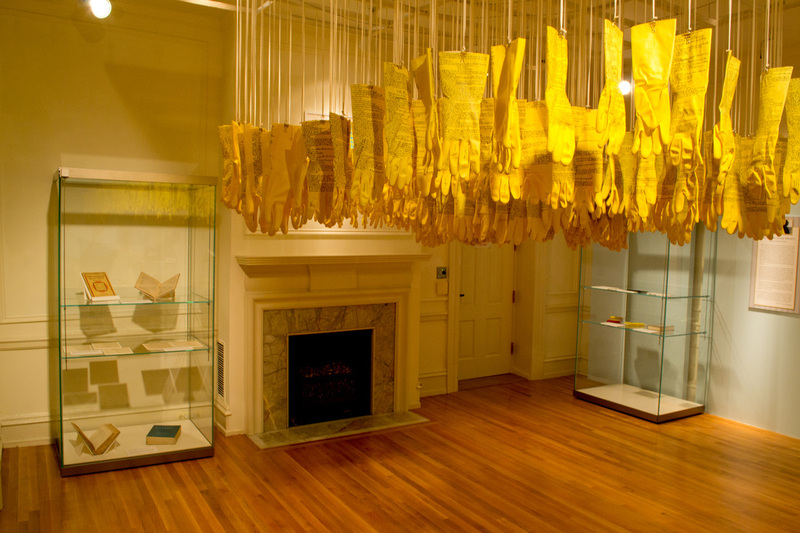 The center of the exhibition room was dominated by the fantastic Ulysses Glove Project, a contemporary art installation by Jessica Dean Rosner. Jessica Dean Rosner's Ulysses Glove Project and one of the exhibition's display cases. Printer Maurice Darantière's copy of the first edition can be seen in the lower left.